The S&P 500 is the most widely referenced index for the U.S. stock market. However, the Wilshire 5000 index is most representative of the U.S. stock market because it encompasses every single stock in the U.S. stock market. While the S&P 500 has yet to make a new all-time high, the Wilshire 5000 index has already made a new all-time high vs its January 2018 all-time high. It has taken a rather long time for the Wilshire 5000 to make a new all-time high: 123 days to be exact. 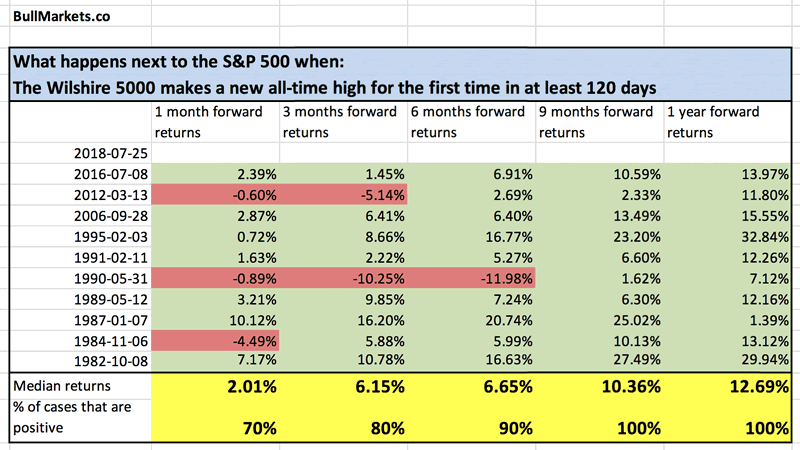 Here’s another way of visualising this market study: the S&P 500’s 1 year forward returns when this study gets triggered. As you can see, when the U.S. stock market (Wilshire 5000 index in this case) makes a new high for the first time in a long time, it tends to go up even more in the next 6-12 months. The stock market does not just make a marginal new high and then crash. The stock market’s medium and long term outlook (next 6-12 months) is bullish right now.